Wanna save a little dough? 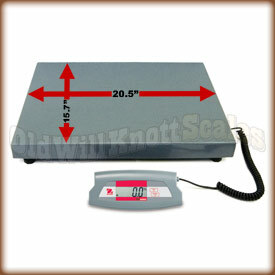 We have this scale available at a lower price. The catch? It was returned to us by a customer who didn't want it. Check it out! Ohaus SD200L AM - Open Box. 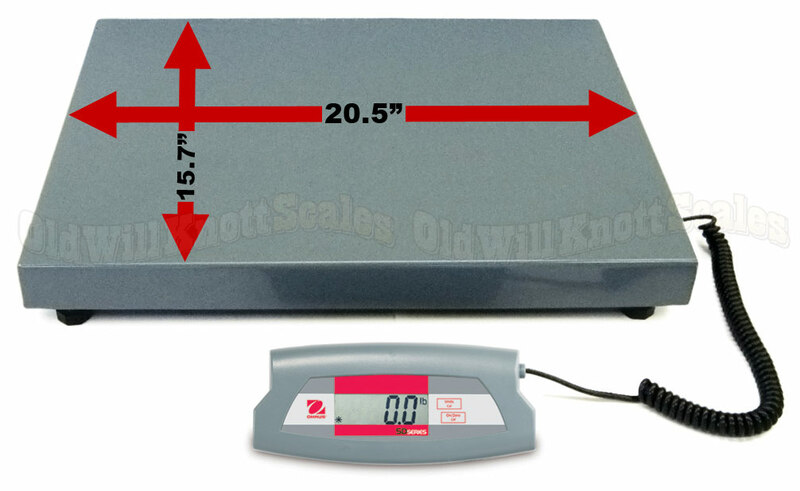 Platform Size 20.5" x 15.7" x 1.8"
Indicator Size 8.27" x 3.58"
Dynamic Weighing This durable shipping scale has a really cool dynamic weighing feature. This feature allows you to accurately weigh unstable items, (this is great if you're using the SD200L as a veterinary scale to weigh those wiggly critters), by calculating the average weight of what's on the platform. Digital Remote Weight Display If you've ever had a tough time seeing the weights on your scale's display because of a large package, (or anything else that might cover your weight display) you'll know what a great feature this is. Ohaus designed this shipping scale with a digital weight display that pulls away from the scale so ya can see your weights even with a BIG package on the scale...and, the extendable coiled cable reaches over five feet long! Adjustable Feet To get the most accurate weight readings from this bench scale, it's best to keep it nice and level when weighing. Ohaus designed this scale with adjustable feet that twist in and out, so the SD-200L can be level wherever you decide to use it. Durable, Painted Steel Platform The Ohaus SD200L has a painted steel weighing platform for easy cleaning and long lasting durability. Painted steel resists rust and corrision making it perfect for industrial weighing such as shipping and receiving, spot checking, and more. Easy To Clean Membrane Keypad You won't have to worry about dust and dirt getting stuck under and around this scale's buttons...The SD has an easy to clean membrane keypad with accurately labeled keys for easy weighing. Auto-Off Feature If ya have ever had the batteries in something run out because you forgot to turn it off, you'll realize what a blessing this feature is. When ya use the SD200L with battery power, the scale will automatically turn off after a few moments of inactivity. Tare Feature The tare button on this digital scale's weight display can be pressed to "zero out" the weight on the scale. You can then add more weight, and the display will only show the weight of the items you're adding. This sure is useful when ya want to use a separate container for weighing your things, if ya want to put a mat on the platform, or if ya want to get separate weights of multiple items. 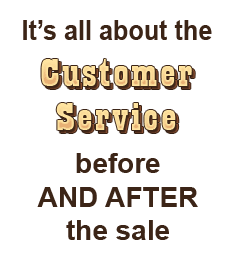 1 YEAR MANUFACTURER'S WARRANTY! When ya get this digital scale, ya need to go over to the Ohaus website and register it to receive a one year warranty.